Historically, water from the area that’s now Beacon Yards flowed into a waterway called Salt Creek, which was covered up long ago, and then into the Charles River. 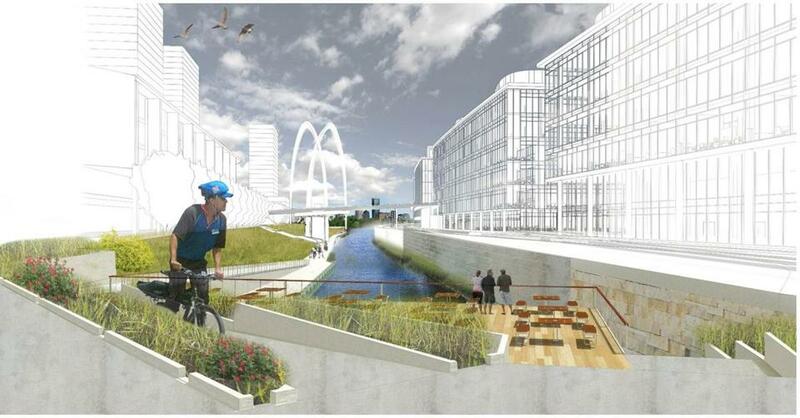 A proposal by Northeastern student Matt Rowan would recreate it as a system that would direct water through retention ponds where plants would help clean it up, and then into the signature feature shown here: an open-air waterway, in the heart of the new Beacon Yards, whose banks would be the most vibrant part of the emerging neighborhood. Along the waterway would be a kayak launch — turning a spot now isolated by the Mass. Pike into a portal to the Charles. Storm-water disposal is often an ugly afterthought in urban design schemes, but Rowan’s plan would turn it into a centerpiece. The land beneath a vast highway interchange in Allston could benefit from some fresh pairs of eyes. Through a lucky convergence of events — the state’s move to all-electronic tolling just as a half-century-old Mass. 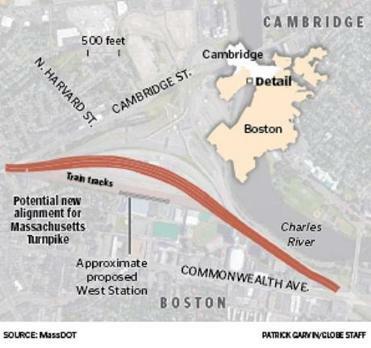 Pike viaduct nears the end of its intended lifespan — the Massachusetts Department of Transportation plans to straighten out the highway a bit and free up dozens of acres long given over to toll booths and asphalt ramps. To maximize the use of that land, known as Beacon Yards, today’s highway planning needs to consider how a future neighborhood on the site might function. Some intriguing ideas come courtesy of a graduate architecture studio at Northeastern University. Tim Love, now president of the Boston Society of Architects, convened a design charrette last year to brainstorm about Beacon Yards; he also asked his Northeastern graduate students to work through some of the practicalities of redeveloping the site. How should storm water be cleared from the area? What should the buildings look like? How might future residents deal with noise from the reconstructed highway? How would pedestrians, motorists, and bicyclists get into West Station, a major transportation center proposed for the southern edge of the site? In the illustrations on this page are answers to two such questions. Still, a lot can go wrong in the official bureaucratic planning process. An early proposal from MassDOT prioritized vehicular movement above all other concerns. Fortunately, the agency has been willing to revisit the issue, but the tension between road and neighborhood design remains. Building certain elevated roadways atop solid earthen berms rather than sleek bridges could keep maintenance costs down, but also inhibit private real estate development at Beacon Yards. Independent design input — from students and professionals alike — helped shape the current incarnations of the Prudential Center and the Rose Kennedy Greenway. Love says his students’ work on Beacon Yards “provides public agencies and other stakeholders with data and images they wouldn’t have otherwise, and that affects the public conversation.” Ultimately, how the area develops will be up to Harvard — which owns the site but has not yet offered detailed plans for it. That’s all the more reason for others to put their boldest ideas forward now. For longtime Pike users who’ve driven past or through the Beacon Yards area thousands of times over the course of decades, seeing it as anything but grim transportation infrastructure isn’t easy. But for designers who are engaging with the site for the first time, the possibilities are endless. For residents and business owners on the north side of Cambridge Street, the Mass. Pike interchange project would be transformative. Instead of looking out on grassy berms that support highway lanes, they’d see buildings and new neighbors. Northeastern student Kelsey Holmes looked at how today’s street grid would meet Beacon Yards. 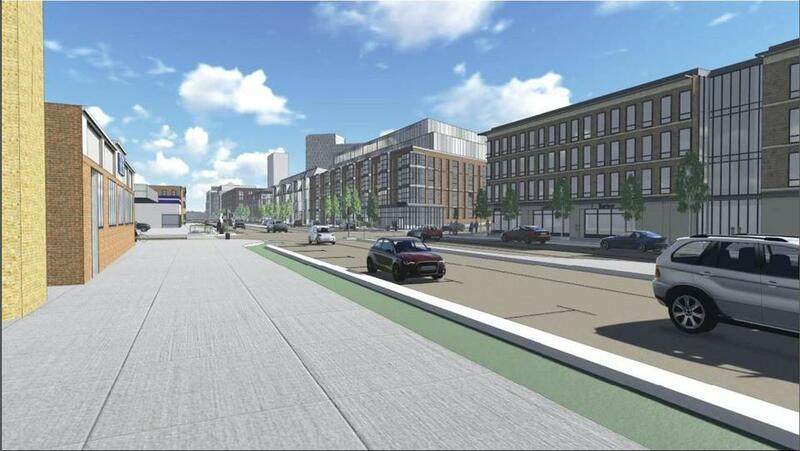 She envisions buildings of up to 250 feet tall in the distance, but much shorter residential and retail buildings along Cambridge Street, which would be redesigned as a boulevard rather than as an off-putting highway access road.